This video shows everything, start-to-finish, about installing a retaining wall with drainage in Minneapolis. This project was installed nearly ten years ago, and you can drive by today and see it in all its glory! We also built the walls next door. This client wanted three things– to stop mowing their steep hill, to have a flat space for plants, and to manage the water coming out of their downspouts up by the house. The design was fairly simple (although nowadays we would change a couple aspects of it.) There are two tiers of retaining walls to get rid of the slope and provide a flat planting space, and we collect water from the front downspout and route it down with drain tile toward the front of the retaining wall. Once the base is ready, we can start placing our blocks and building the drainage which allows water to get from the upper yard down through both walls. Generally when you see a retaining wall tipping over or falling apart, it’s because there isn’t proper drainage behind it to allow all the water to get through and out. In the video you see we have 6-10” of space behind the wall, from the bottom to nearly the top, filled with loose angular rock. We put fabric behind and over the top of that rock, keeping is separated from all the dirt, to make sure that the drainage rock never clogs up over time. This allows excess water to fall from the top of the wall to the bottom, and continue moving out the front. If you DON’T have that drainage behind the wall, the water saturates the soil and gets stuck back there. The soil gets very very heavy and pushes against the wall. This starts to cause the wall to want to lean forward. When winter comes, if that soil is still soaked, it freezes and forces the wall out a little bit. When spring comes, the soil thaws, and falls down a little bit into the void created when the wall leaned forward. Now the wall is stuck there and can’t lean back to where it was. Each year, the freeze/thaw cycle will cause it to lean a little more, and a little more, and, well, you get the point. Eventually the wall will topple forward. So the first most important part of building a wall is the base. The second is having proper drainage so the water can all get out from behind the wall. Whether the wall is made of natural stone or concrete blocks, the construction method is the same. Boulder or Rip Rap walls are different and don’t require the same base preparation or drainage. We’ll hit that nuance in another article. In this project, you’ll see we connected a downspout with drain tile all the way to the front of the retaining wall. Nowadays, the city doesn’t allow storm water to flow directly to the sidewalk. All we would do differently is have the downspout release the water in either the planting area, or in the grass above the wall. This would allow much of the water to disperse into the plants/sod. Any water during a huge storm that the planting area couldn’t handle would be able to exit through the drainage rock in the wall, so it wouldn’t be trapped and cause the wall to eventually fail. We collect downspout water into drain boxes to carry it further from the house all the time. It’s a great way to make sure water gets away from your foundation. All the downspouts at our own house are collected this way. Oftentimes, if your property gets an occasional wet basement, this can solve the problem. There is one other interesting tidbit to know about retaining walls specifically in Minneapolis. So, not any of the suburbs, not St. Paul, but strictly Minneapolis the city. Minneapolis is in the middle of changing their zoning codes, and they intend to have that complete around the end of 2019. Currently, they have a very inconsistent interpretation of what sort of retaining walls they will allow. In fact, they believe their code gives them the authority to ban nearly ANY retaining wall within 25′ of the front property line, or 5′ from the side or rear property lines. The specific code language on the books is not clear at all. And given that you can see retaining walls, both old and brand-new, all over the place in Minneapolis, it’s obvious that enforcement is inconsistent. Walls like you see in this video do not require building permits, so needless to say, it’s odd that the city would say it has the authority to ban them. Even odder is they have ordered some ALREADY EXISTING retaining walls to be removed, while the hundreds of other existing walls are allowed to stay. This gets scary for anyone who has a retaining wall in Minneapolis, especially if it was built in the last few years. Right now the city believes they have the authority to order an existing wall removed, and I know of several addresses where they’ve done it. I personally, along with several other landscape company owners and people from the Minneapolis Nursery and Landscape Association, have met with several Minneapolis Ward Representatives to give our input about their eventual code language changes. We think (as do our clients) that homeowners should have the right to flatten out their yard. It’s YOUR property. If you’re not changing how water flows, shouldn’t you be able to flatten your yard instead of mowing some crazy steep hill? We think you should. We also think the current code language they’re using to ban walls is totally unclear, and was not adopted initially for the purpose they’ve put it to recently. It’s unfair that some property owners can have walls while others can’t, and that some companies can build walls today while others can’t. The code needs to be clear, and to be applied fairly to all concerned. We’re doing our best to make sure that in the future, it will be that way. Right now, though, it’s still a very gray area. We’ll have another article addressing this issue more in-depth. But for the moment, what you need to know is that Minneapolis might or might not currently allow the exact wall you see in this video. They would “probably” allow the next door neighbor’s wall, because it is shorter than 24” at the sidewalk. But they also might say it’s not allowed. 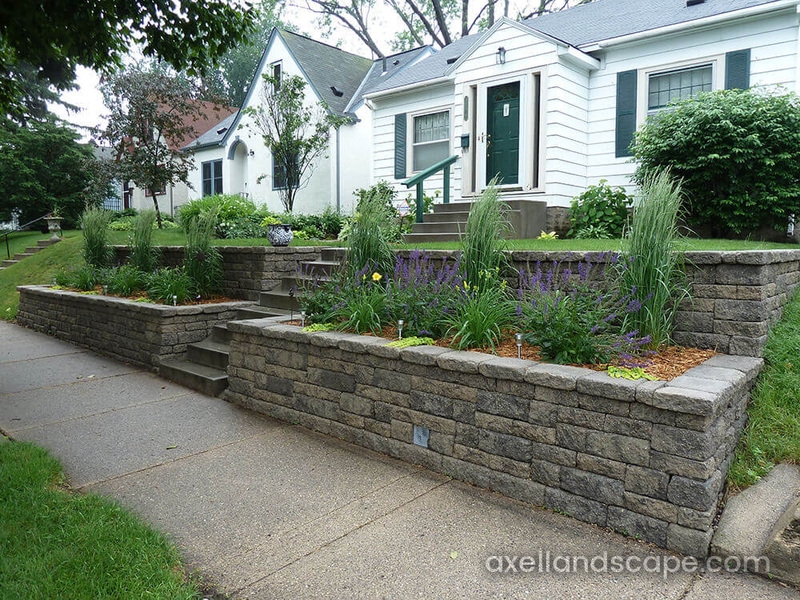 Long story short, if you live in Minneapolis and would like a retaining wall, get in touch with us and we’ll see what they’ll allow. We know exactly whom to talk to about it. If you have property in Minneapolis with retaining walls near your property lines (which we personally do) and think you should be allowed to keep them, I’d encourage you to contact your Ward Representative to let them know. They’re trying to vote on new code at the end of 2019. We need to encourage them to make the code clearly allow your walls. For everyone else outside the drama in Minneapolis, you’re free to have any wall you want that’s four feet or less! No permits required. And if you need a wall taller than four feet, we just need to have engineered drawings and go through the permit/inspection process, which is generally quite straightforward. Hope you enjoy the video. Contact us with any questions! Edina Patio, Gas Fireplace, and Sitting Wall with No Sod Damage! Does Landscaping Cause a Lot of Lawn Damage? Why is Compaction So Important? Follow us on social media to see even more from Axel Landscape! Just finished editing a fun project video. Give it a watch at your leisure. Any feedback is welcome, thanks!